We are so proud of Nikolai's achievements!! He received many awards including "A" honor roll certificate for achieving a grade of "A" in every subject area in every quarterly grading period, a trophy for his outstanding accomplishment in the Accelerated Reader program (highest points in his class), recognition for his achievements in the Gifted/Talented program, for perfect attendance and more. It is especially rewarding for us to see him set, pursue, and achieve his lofty goals. **If you like what I am doing here, I would also love for you to follow my Facebook page. I'll be posting more often on fb than my blog during summer with some cute and fun foods which I occasionally find on the web. 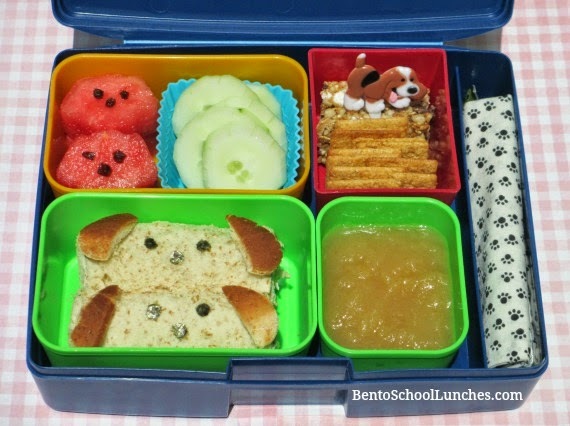 Bottom left: Roll ups sandwiches with nori and bread crust accents. Bottom right: Apple sauce. There is a lid for the green container which prevents a spill. Top left: Watermelon cut into dog shapes and I added raisin bits for the facial accents. Cucumber slices in a silicone cup. To right: Granola bar and wheat thins with a dog cupcake pick. Adorable lunch! I love your watermelon dogs! Congrats, he's so outstanding. :) Doggy roll ups are so cutee! Congrats! These doggy roll ups are adorable! Jean, thank you so much for your kind comment!